I hate to sound like a broken record, but damn do I miss the artistry and beauty of vintage toy packaging. It’s a lost art, much like movie posters. Modern packaging, for all its slick style and strong branding, has lost its charm. 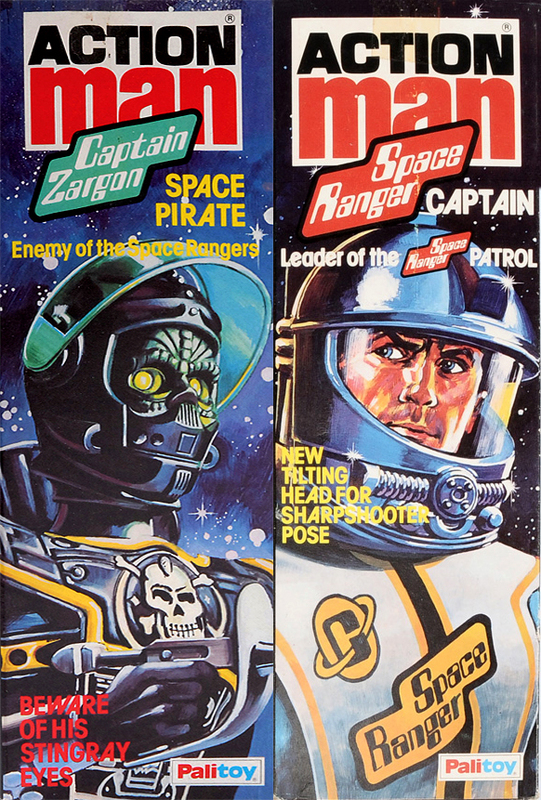 Captain Zargon and the Space Ranger were no doubt some of the most fanciful Action Man figures. The box art is appropriately eye-catching. As an early 80s Star Wars kid, I would have been all over these. Stingray Eyes. That’s just awesome. Kids today don’t know what they’re missing. My little brother had an Action man toy from the late 90’s that had moving eyes that operated by the movement of a lever at the back of the figures head. He loved it. Those old coffin boxes are great. I can’t think of a single Joe/Action Man coffin boxed figure I wouldn’t love to add to the collection. Major drawback to that space commander figure: the uniform rips VERY easily, made from a thin, rubbery, almost balloon like material. Captain Zargon reminds me of the Adventure People’s Clawtron. I know Fisher Price just repainted a biker helmet, but I wonder if Zargon inspired the deco? Clawtron and the other space related fisher price stuff, are my jam. From alien astronaut to xray alien couple.